Ribbon Cable, Connectors and Assemblies, Flat Cable, SCSI, Serial, IDE, etc. Low Prices for SCSI, Serial, IDE, etc. 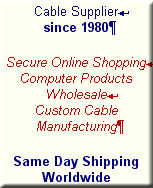 Our company offers ribbon cables, connectors and assemblies for various interfaces, such as SCSI, IDE, Serial, for both desktop and laptop computers. We sell our ribbon flat cable products, at very competitive prices. We are a well established supplier of connectivity products, with more than 25 years of experience. You can easily select and buy ribbon cables in our secure Online Store, or you can Request a Quote for Discounted Quantity Orders/Wholesale. If you don't know what kind of ribbon cable you need, we suggest you to call us. We will gladly help you find the right cabling solution for your application. For your easy reference, please find below a list of ribbon cables, presented in various combinations and naming.